I was inspired by Kerri and Kelly to feature some of my diabetes dinosaurs (not so ironically, I had both of their dinosaurs at one time, I still have the blue thing, but the Accu-Check was discarded), so here's the first one from my relics collection. I got this around 1976 ... I'm still looking for the book from Bayer (then known as Miles Laboratories entitled "Mr. Hypo(dermic) is my friend" which featured a hypodermic syringe with a smiling face telling us that needles were a good thing. I haven't uncovered that on eBay (yet) ... but back then, Diet Delight (see here for a 1960's commercial featuring a young Dabney Coleman) published a cookbook featuring fruit without the typical "heavy syrup" (which was pure sugar) which carried the brand-name Diet Delight. Founded in 1958, the cooperative remained in business until the early 1990's, when it was disbanded. Still, as a kid, while I appreciated the fruit without the added sugar, I was less enthused by having to eat "special" foods. 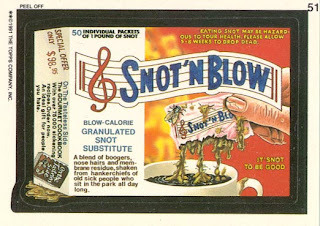 I realize I'm probably dating myself here, but as a kid during the 1970's, and one thing that was very popular among the grammar school set were Wacky Packages which we not only collected and traded, not to mention stuck on desks and lockers in schools across the country, and these were essentially parodies of various consumer products. 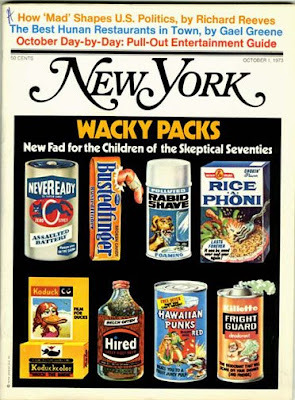 In fact, the New York magazine ran a front-cover story on them, calling them "the new fad for children of the skeptical seventies". Topps, Inc. resurrected the Wacky Package stickers a few years ago to very good sales, largely from adults who remembered the cards fondly. Since then, they have released a number of new series, as well as resurrected some of the originals in "flashback" series. 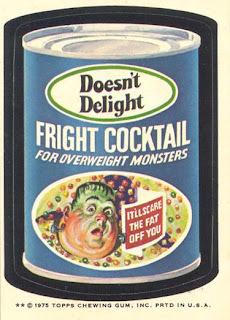 I delighted in the parodies made into stickers known as (which are the most successful line of non-sports cards ever published, so you can imagine my delight when "Diet Delight" was parodied as "Doesn't Delight" ... which I stuck on more than a few lockers and desks back then! I'd really like to solicit all of the Diabetes OC's PhotoShop wizards and even artists who can draw to create a diabetes Wacky Pack ... featuring various diabetes products we all know (and often hate) to bring some levity to this stupid disease. I must admit that my computer graphic skills are somewhat limited. Although I have Photoshop Elements (a slimmed down version of Photoshop), I really have yet to master using it. Perhaps when I have the luxury of time, I can pursue that, but today I'm soliciting your creativity and hope to bring some levity to an otherwise depressing, $10 billion/year industry of diabetes products. 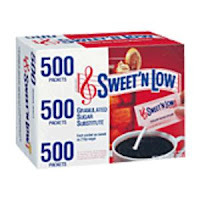 The fine folks at Topps have already provided few shining examples, but I'm hoping you'll make this a flood of parodies on everything from sugar-free foods (and I use the term "food" very loosely here) to glucose tabs and even diabetes nutritional products like Glucerna (after 33 years of living with diabetes, I still see no use for this stupid product). 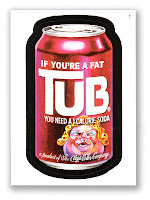 Here are a few real products, and the Wacky Package parodies for your holiday! Anyway, on this Thanksgiving Eve, I'm SOOOOO grateful for not for Diabetes Technology, but for people who HAVE A SENSE OF HUMOR!!! Yowza--I had that same diet cookbook as a kid and I vaguely remember a Mr. Hypo comic, too. If I saw it, I bet I would know it. Awesome post! Oooh, Wacky Packs! I loved those things. I have Fright Castle and Mr. Coffin stickers on my desk right now...no idea where they came from, but there they are. They make me grin every time I see them. 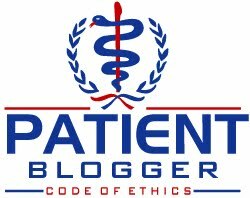 Another blogger actually still has a copy of Mr. Hypo. I can email you the scanned book if you'd like. It's scanned in black and white instead of the oh so delightful black RED and white, but you can at least revisit the golden days of diabetes lit for children. let me know if you want me to send it on. I'm having some MAJOR flashbacks!! I think I had Mr. Hypo & I loved Wacky PACKS!!! Thxs for the memories, and the link! 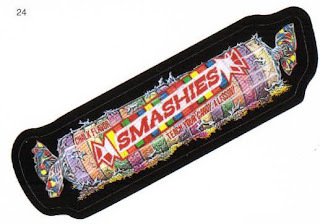 Wacky Packs...loved 'em! I atill remember Mr. Hypo, too. Lost my copy, sadly.